Author Sigal Haber has a great new book for children, called Chuck The Rooster Loses His Voice. She wondered how to introduce the concept on entrepreneurship to young children. She also wondered how to teach them in a fun way what it means to be a leader in a community- and to take responsibility in a humorous way? 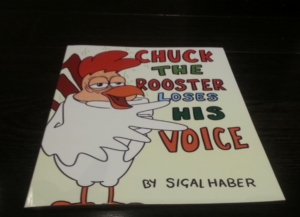 These questions brought her to write Chuck The Rooster Loses His Voice. After years of teaching and researching entrepreneurship as a University Professor, she finally could make her dream come true, That was to write a children story to bring this message to young kids. It is well known fact that everyone can take initiative and be an entrepreneur. But what does it take? So, what happens in a farmyard when the Rooster who supposed to wake everyone in the morning? Life starts to go wrong. In an attempt to deal with the situation, the animals try to find a replacement from amongst themselves, to fill the Rooster’s place. So they organize a singing contest. Will someone be found to take Chuck’s place? How will the Rooster react to the idea? And will there be another “Farm Idol”? The story combines adjusted concepts for children from entrepreneurship and management fields in which she specialized for many years as University Professor. The story highlights how situations seemingly problematic can be seen as an opportunity for development of social ideas within a community. It shows how leadership and self-confidence can help in promoting an idea regardless the difficulties involved. Furthermore, it shows that even if an initiative is not being completely realized, there are still ways to leverage the knowledge and experience gained during the process in order to improve it or to start a new one in the future. Want to read more ? Check Sigal’s author page on Amazon. And ask for it on your local library.